J.B. Hunt Transport Services reported mixed results in the fourth quarter of 2018, with a slump in intermodal shipments and charges related to an ongoing arbitration dispute with BNSF Railway overshadowing strong gains in its dedicated contract carriage, freight brokerage and over-the-road trucking businesses. The Lowell, Ark.-based transportation services company reported net income of $88.7 million, or 81 cents a share, in the three months ended Dec. 31, compared with net income of $385.3 million, or $3.48 a share, in the same period a year ago. Revenue climbed 15% to $2.32 billion in the final quarter of 2018 from $1.99 billion in the same period in 2017. For the full year, J.B. Hunt posted net income of $489.6 million, or $4.43 a share, on revenue of $8.61 billion. That compared with net income of $686.3 million, or $6.18 a share, on revenue of $7.19 billion in 2017. Results for both years are distorted by one-time charges. The company took a charge-off of $134 million in the fourth quarter for continent liabilities related to a dispute over terms of a revenue-sharing agreement with its primarily rail partner. In 2017, the company recorded a one-time gain of $309.2 million to reflect a decrease in tax liability due to passage of the Tax Cuts and Jobs Act. Breaking down the results by division, J.B. Hunt Intermodal reported operating income of $32.4 million on revenue of $1.26 billion in the fourth quarter. That compares with operating income of $93.3 million on revenue of $1.1 billion in 2017. Total loads dropped to 512,935 from 515,669, but revenue per load increased to $2,463 from $2,129 due to higher rates. 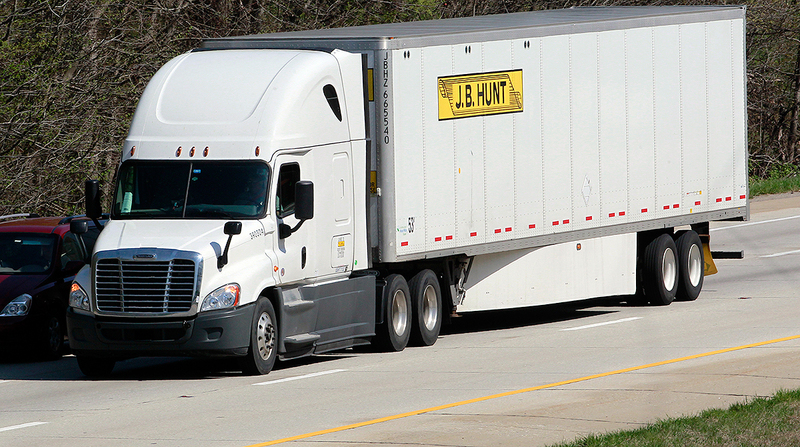 J.B. Hunt Dedicated Contract Services generated operating income of $59.4 million, up 70% from $34.9 million a year ago. Revenue increased 25% to $596 million from $477 million. Revenue from final-mile delivery services increased by $17 million in the fourth quarter compared with a year earlier, and the company added a net 1,388 revenue-producing trucks last year. J.B. Hunt Integrated Capacity Solutions generated operating income of $16.1 million in the fourth quarter, a gain of 43% from $11.3 million in the comparable period in 2017. Gross revenue climbed 7% to $345 million from $323.2 million. Gross margins increased to 16.9% in the fourth quarter compared to 14.1% a year ago, as the company benefited from rate increases on contract freight. J.B. Hunt Truck generated operating income of $14.7 million in the fourth quarter, more than double the $6.4 million earned in the prior-year period. Revenue increased 21% to $117.7 million from $97.5 million. Revenue per load rose 10% and the company boosted its tractor count to 2,112 in 2018 from 2,032 in 2017. J.B. Hunt is the nation’s largest intermodal service provider and dedicated contract carrier. The company ranks No. 6 overall on the Transport Topics Top 50 list of largest logistics companies in North America and No. 4 on TT’s Top 100 list of largest for-hire carriers.